Award Entries and September Stupidity! Well it's fair to say that September has been a busy month at Yogabomb HQ. September Stupidity has been an amazing success, 126 eager yogis signed up for 30 days of hot yoga for £30. An absolute bargain for some!! Some people just stuck to their usual 1 or 2 classes a week, still getting a saving on their regular price, others decided to really go for it and take the challenge. We have 2 days left until the end of the month, this last week has seen a last minute flurry of bookings to get that final class in before September ends. It has been a great way to reward current Yogabombers, rekindle past Yogabombers and introduce new Yogabombers to the studio and to hot yoga in York. Feedback has been really positive and the energy and vibe in and around the studio is awesome! Lots of yogis have found their flow and detoxified their bodies like never before! In a few days time I will collate the totals for the month and see who is chief Yogabomber and every name will be entered into the prize draw. I also decided to enter for a few women in business awards this month. As if I don't have enough on with September Stupidity - I had to write thousands of words about myself and my business. It sounds pretty easy but I found it so hard! But to be fair once I got going I found it hard to keep within the word count! Anyway I entered Yogabomb/me for the Best Business in Health and Wellness Industry and for the Most Inspiring Business Woman categories. Nothing like leaving it until the last minute, the deadline was Tuesday 5pm and I posted mine on Monday with guaranteed delivery. Fortunately they did receive my entry and I now have to wait to find out if I'm a finalist! The shortlist of finalists are announced next week so at least I don't have to wait long. Entering these awards has made my realise how much I have achieved in the last eighteen months and how awesome I am! - No, seriously - how awesome Yogabomb has become. It finally feels like summer may have arrived in the UK, with the tentative promise of a few days of sunshine and warmth! I have been very fortunate to spend a couple of weeks recently in Turkey. The first week with a close friend of mine at Juicy Mountain, a juice and yoga retreat near Fethiye. We survived on juices and no solid food OR ALCOHOL for 7 days. It was a truly liberating experience and we felt amazing afterwards. 9lbs weight loss was obviously an advantage as well as clear skin, bright eyes and bushy tails! Early morning rebounding sessions to classical music, 3 yoga sessions and meditations every day. Mountain walks and juice demos, capoeira classes.... AMAZING! Whilst we were at Juicy Mountain there was a terrorist attack at Istanbul airport, fortunately we were far enough away for it not to affect us, it was good to get home safely to our family and friends. This last week I went back to Turkey with my family and some friends for a family all inclusive holiday - detox to retox springs to mind!! Again we had a fabulous time and enjoyed amazing weather, racing down waterslides and eating ice creams! Not quite the same weight loss this time but still relaxing and great to spend time with the children to start their much needed school holidays. As we were at Dalaman airport waiting to fly home there was a military coup in Northern Turkey and all hell broke loose. Again we were very fortunate to be able to fly home on time as all other flights out of Turkey were grounded that evening. Where did the first 3 months go?? Crazy how fast the time has flown by since Yogabomb's doors first opened. That's not bad going for the first 3 months! Our first themed freestyle was a HUGE success - 80's music and Yoga definitely do mix! February 12th is the next planned freestyle session with the theme being Old Skool Hip Hop. Book your mat space and choose your track for the playlist! So much has happened yet I'm struggling for words to explain it all. Yogabomb's first 3 months have exceeded my expectations, I have loved it and hated it, had highs and lows, but would do it all again no problem. I just hope that the next 3 months can be equally amazing and the Yogabomb word keeps spreading.. The two open mornings went really well with over 60 people coming through the front door and checking out Yogabomb! Classes started on Monday with a full to bursting timetable. This week has exceeded all of my expectations. We had new and old yogis signed up for every class, some amazing power flows, awesome ashtanga, demanding yin flow and great beginners classes both hot and not. The vibe was exciting but relaxed at the same time. The grip dot towels flew off the shelves and I think that I single handedly drank all of the water that the fridge could hold! As the week progressed more people signed up for the introductory offers and block of classes, some people even attending 3 classes in a day! The Yogadudes class yesterday was fabulous! 8 guys all different shapes, ages and sizes. A few with yoga experience, others with none! The testosterone in the room was sky high, egos were left at the door as they all pushed themselves to their max and gave their all to the postures. The opening week ended with a lovely 90 minute Detox Flow class. The temperature was at a moderate 30 degrees, the music calm and chilled and the twists were endless! After teaching 19 classes this week I have to admit that I am exhausted!... But very happy! 96 BUMS ON MATS - AWESOME! Can yoga really change your headspace? A few things have happened to me over the last couple of days that have made me stop and think about my mental space. There's a lot of things going on in my life right now, especially with the studio opening less than a week away (aaarrgghh! ), having 7 house guests for 3 nights this week (double aaarrgghh!) and the school holidays (no explanation needed....), but in my opinion i do believe that i have managed to keep a sense of calm and focus whilst my head has been swimming with to do lists and the never-ending demands of family life. Yesterday I had my much needed fortnightly chiropractic adjustment, and after a day of sitting at a screen i took advantage of the horrendous weather and traffic in town, put on my waterproof jacket and trainers and stomped through town and all the puddles forming along the way and enjoyed some fresh(!?) air which helped to clear my fuzzy brain. I had to cross a busy road during rush hour and was waiting patiently for the green man to appear when i noticed the guy next to me. Probs about 70 years old, smartly dressed with a small wheelie case in tow. I was so surprised by what happened next... The green man started flashing and as we set off to cross the road there was a car that had stopped slightly over the pedestrian area as the driver hadn't had chance to turn right. The 70 year old guy then launched into a torrent of abuse at the driver, squaring up to him at the window of his car - where his wife and young children looked out equally horrified. This went on for the duration of the road crossing, the poor car driver had not done anything wrong, he wasn't breaking the law, there was plenty of space for us to pass by. I so felt like telling my fellow pedestrian that he in fact was the f***ing a****ole, not the car driver! Also how many times do we witness road rage nowadays? The slightest things wind people up. Why not let someone out at a junction, or let the other driver merge before you when 2 lanes become 1. Does it really make that much difference? It has made me recognise that life is so fast paced, so stressful and hectic for our society that everyone, now and again - or everyday if possible - needs to take time out to find some mental calm, otherwise we can react badly to the slightest of things that normally wouldn't bother us. I find my mental calm in lots of different ways. Now that i have become more aware of my state of mind i make sure that i give myself time to LET GO and destress. it can be anything from walking the dogs, meditation, taking a bath, going for a run or my fave....... Yoga (obviously). Yoga is amazing at giving you the time to let all sorts of sh*t go and calm the mind - as well as giving you an awesome workout! That 70 year old guy needs to find some mental calm, he needs to be Yogabombed! Quite a lot has happened since my last blog.. it has been pretty manic to say the least! The studio is coming along nicely. Changing rooms are being built, I've chosen tiles, flooring, shower furniture etc. The strand woven bamboo flooring has been ordered for the studio. My graffiti guy has been here the last couple of days doing the artwork on the main studio wall. I don't want to spoil the surprise so the pic is just a taster! Dan the plasterer is busy making all of the surfaces smooth too ready for mirrors and more paint! My humidifier and air exchange system arrived this morning. It took 5 men to lift it off the truck, it's so heavy. Luckily I arrived just as they finished moving it! My website is nearly done, just putting the finishing touches to it now. Now my priority is to get my mindbody software working for me. It's an amazing program, so all of my clients can book on line and schedule their classes, it just takes a lot of inputting from me! Best get on with it! LAUNCH DATE NOVEMBER 9TH!! BRING IT ON! Today has been a busy day! I also had a site meeting with the heating and humidity company. Oh my, talk about feeling out of my depth at times! But it has given me the confidence that I am doing it correctly and if you're going to be a bear you may as well be a grizzly! I may have to delay the studio opening by a week or so which is dissapointing but otherwise i'll be breaking my neck to get it finished AND I've got 3 children on half term to contend with! If you get chance have a read through my site and the class descriptions and let me know if there is anything that I have missed! Being a wife, a mum of 3 young children, a hotel owner and having 3 energetic dogs, people often ask me why I decided to add more stress to my already busy life by wanting to open my own hot yoga studio. I would like to think that I'm the sort of person that thrives on being manically busy. I don't like to be sat down resting, there's always 101 things that I could be doing. However, saying that the stresses and strains of living this way (and also being a self-confessed control freak) do take their toll on my mental health. I have had a few battles with depression over the years and needed a little extra help along the way. Yoga gave me the headspace that I needed to function effectively. I was able to use Yoga to help give me much needed mental clarity and to find calm when everything around me was moving at 200mph. It's amazing the power of a downward dog! I began practising once a week, then twice, then more and more. I was hooked. Then a good friend and I would find new yoga classes and styles to go and try together, enjoying the diversity of yoga styles available. I LOVED hot yoga, it was the one that I kept going back to and wanted more of. The feeling I got when I finished a class was exactly what I needed both physically and mentally. I like to feel like I have done a monster work out, I like to sweat and ache the next couple of days. Hot yoga gave me all of this and also helped release my mental state of mind! After 6 years I was able to come off my medication and yoga became my new medicine! Then all of a sudden all 3 of my children were going to be in full time education.. what to do? Again I kept going back to hot yoga, it was a real passion of mine and it motivated and inspired me. My husband was complaining about being a 'yoga widow' as I was always going to classes or practising at home. Can't quite decide which angle to go for with my branding.... Some feedback has been positive, some very amusing! I think I'm going to go for the bomb symbol which some think looks like a stomach or a heart diagram.... But I like it! Yesterday I actually had 18 hours sat in a bed (don't ask) and it was extremely productive... It's amazing how many Chinese companies are willing to sell anything plastic for next to nothing! But I think I am going to support the British economy and purchase from local suppliers! i also woke up at 3am in a blind panic about changing room doors.... Randomly.... Then couldn't get back to sleep. My brain seems to be on overdrive at the moment, I definitely need to find some time for headspace this weekend, in between forest quest, Saturday school, rugby training and paintball birthday parties! Not sure how I'll find time but need it so much!!! If you have a quick fix meditation technique to share please let me know! 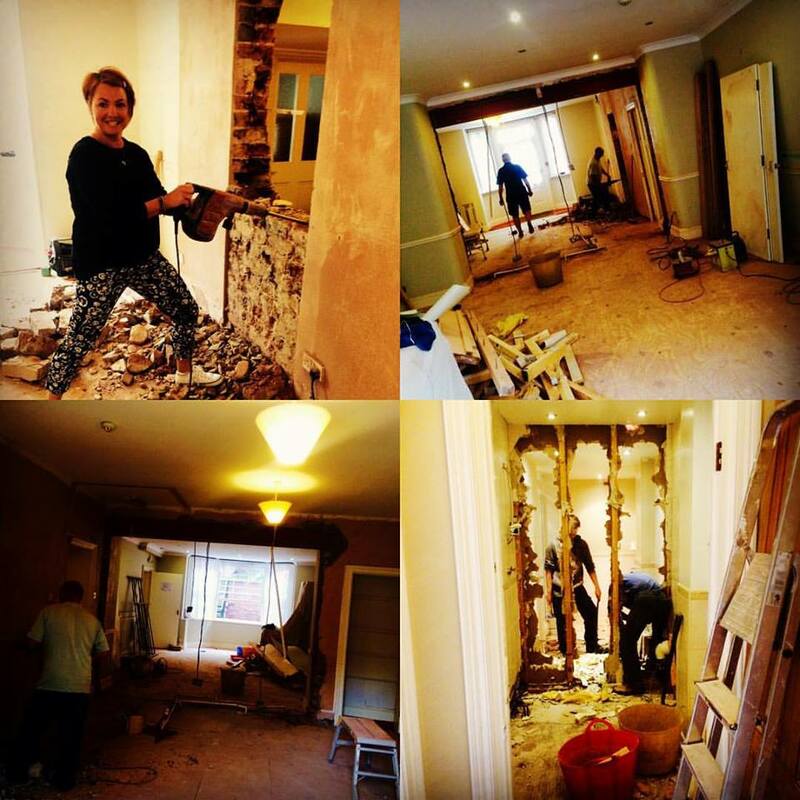 Well the day has finally arrived... the builders are here and the walls are coming down starting to create the Hedspace studio where all of the Yogabomb classes are to be held..... very soon! I have spent most of the day discussing the widths of shower cubicles, comparing infrared heaters, finalising price plans and timetabling, choosing flooring and discussing humidifiers. There is so much to do, so many decisions to make and the countdown is on... the days are flying by until open day! Who would have guessed that my life was going to take this direction?